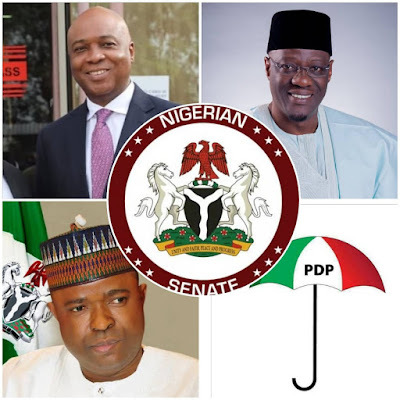 Ibolo monarchs after a meeting over the Kwara South Senate list published by INEC have said it may be better to say that Senator Bukola Saraki and Governor AbdulFatah Ahmed deliberately deceived the Ibolo people. On hearing that APC had chosen it's Senate and House of Representative candidates from the Ibolos, Saraki plotted on deceiving the Ibolos by lying to them that he will take Maigida's Senate ticket and give Senator Rafiu Ibrahim. "Our findings shows that this is a strategy implored to use Sen Rafiu an Ibolo man to break the voting strength of Ibolos. What we're not sure of is whether Senator Rafiu was involved in the grand deception because his silence betrayed his emotion, the fact that he has not protested means that he was part of the grand deception" the Obas unanimously agreed. In order to further deceive the people they went to file a case at the Federal High Court Ilorin to sue INEC for not substituting Governor Fatai's name with Senator Rafiu. Everyone knows that whenever Senator Bukola Saraki wants to get a court order or judgement, he approaches the Kwara State High Court. "It's obvious that they don't want to win this case that's why they went to the Federal high court to sue INEC. For instance, the Ishola Balogun's case they went to the State High Court and got their judgement, same as Sowore's" the Obas stated. A close aide of senator Rafiu Ibrahim confirmed that Governor Fatai had taken delivery of campaign materials last week. We expect the Governor to debunk such claims but till now he didn't. Elders and stake holders in Oyun began smelling a rat when Governor Fatai could not produce his letter of withdrawal forwarded to INEC as demanded by the Ibolo monarchs. "The Ibolo people have seen through the plot and have decided to give their block vote to other candidates who didn't deceive them if Governor Abdulfatah Ahmed fails to produce his letter of withdrawal within the next 24hours" the Obas concluded. this is the theatre department of sarakite dynasty sorry .